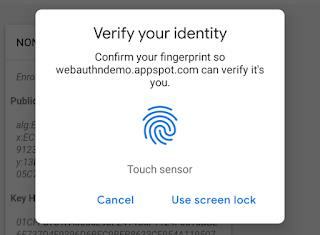 Google Chrome 70 Released with Support for Fingerprint Sensor. Google announced the release of its newest Chrome Beta 'Chrome 70' with several new capabilities like Shape Detection feature and fingerprint sensor. Google, recently, has announced the release of its newest Chrome Beta 'Chrome 70' for Android, Chrome OS, Linux, macOS, and Windows, with several new capabilities like Shape Detection feature and fingerprint sensor. The Chrome 70 version is added with shape detection feature that would enable the device's shape detection capabilities to be available on the web, letting users identify faces, images, and texts. Shape Detection API is available for trial through a Chrome origin trial. The Shape Detection API is an integration of three different APIs: A Face Detection API, a Barcode Detection API and a Text Detection API. New Chrome will exit full-screen when dialog boxes including file pickers and authentication/payment prompts appear. This change is to ensure that users have proper context before taking a decision on dialogs and alerts. Chrome 70 also brings support for web Bluetooth on Windows 10 that would enable Chrome to communicate with other near Bluetooth devices. To see a complete list of the features in Chrome 70, you can visit the complete announcement here.